Learn you to has reset the Epson Stylus TX133 printer, following the steps below. 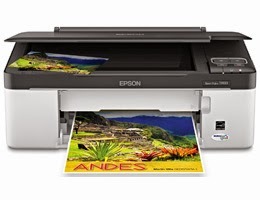 It is the best multifunction printer of its kind, with DURABrite Ultra inks and Epson individual cartridges to save at the time of purchase supplies. Scanner 48 bit and up to 1200 dpi, print paper sizes Letter, Occupation (21,6 x 35,6cm), A4, B5, A5, A6, report, executive, statement, user-defined: (8, 9 to 21.6 cm) x (8.9 to 111,7cm) Envelopes: No. 10, DL, C6 and it is compatible with Windows® 7, Windows Vista®, Windows XP, Windows XP Professional x64 Mac OS operating systems ® X 10.4.11, 10.5.8 - 10.6.x. Something we have to be very aware when we are doing a reset of this and any other Epson printer is that we cannot have any other printer connected. The printer has to be on and running. Both the computer and the printer have to be running perfectly. Then we have the decompressed file we double click on the program file that has the following image. It is necessary to run this file and we can do it by double clicking on right bottom and running the file. Now we select the options that appear to select, after that we click on CHECK to verify that everything is okay, we click on SET, then we click on initialization and then when this process is complete we click on FINISH. After this whole process we turn the printer off.